Kawai EX Concert Grand Piano Embodies an 80 Year Legacy of True Artistry. The Kawai piano line is known for its dedication to an age-old legacy of concert piano design and craftsmanship. It is a legacy that stretches back for over 80 years, a time when a craftsman named Koichi Kawai established a small workshop in Hamamatsu, Japan. There the master piano builder put in a lot of sweat and determination as he honed his skill in the delicate art of instrument making. His quest for perfection is being kept alive today at the Shigeru Kawai Research and Development Laboratory, where superbly skilled Master Piano Artisans work on building some of the world's finest instruments. One of these is the Kawai EX Concert Grand Piano. This fine instrument is the product of traditional piano craftsmanship techniques combined with the latest advancements in piano design technology. Every single model of the EX Concert Piano is meant to embody the newest stage in the evolution of piano design. Each new build is created with the goal of having it be better than the previous one. Because of the scarcity of materials involved and the painstaking design work poured into its creation, each EX Concert Piano is a truly rare artifact. No more than twenty models are made every single year. Try playing an EX and you will actually feel the deep passion, the tireless devotion, and the consummate artistry that is invested in its making. Then you will truly understand the nature and the spirit of the Kawai legacy. Other Kawai piano lines include the sophisticated RX BLAK series of Artist Grands and the high-quality GE and GM series of Baby Grands. These series belong to the complete line of pianos available from the Kawai America Corporation (established in 1963) and Kawai Canada Music. The Kawai piano line is sold across the United States and Canada through a network of authorized dealers. These authorized independent retailers are chosen after a stringent selection process to determine their ability to provide expert sales advice and high quality service of Kawai instruments. The Kawai legacy, which began humbly in 1927 in a small workshop, is now carried on by a multi-national corporation that makes close to $1 billion in sales around the globe on an annual basis. The company employs over 4,000 people across four continents. 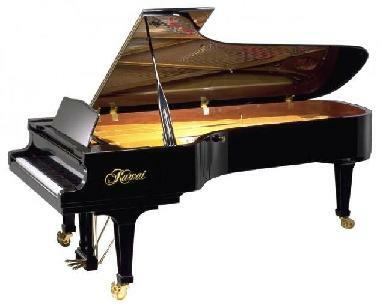 Kawai has earned its reputation for building highly sophisticated instruments that combine the spirit of old-world craftsmanship with the tools of the modern era to result in fine pianos that are truly works of art -- pianos like the peerless EX Concert Grand Piano.